Pity the poor New England Cottontail: It’s disappearing from its namesake. 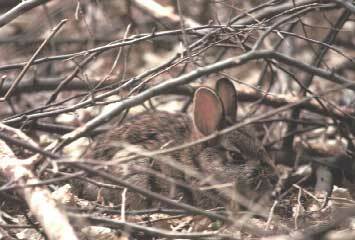 The only native rabbit in southern Connecticut, the New England Cottontail was once widespread from southeastern New York to Maine. Today, studies by Connecticut and New Hampshire biologists are finding so few that this bunny has become a candidate for the federal Endangered Species List. Several forces are working against the New England Cottontail. The thickets it lives in are disappearing, thanks to both man-made and natural changes. Its food is being gobbled up by deer and by the alien Eastern Cottontail, the rabbit we see all the time. Introduced a century ago by hunters seeking new game, the Eastern Cottontail is more adaptable to suburbanization. There’s also the growing number of hawks, owls, coyotes, foxes, and even fishers, for whom rabbit is fine fare. If all that isn’t bad enough, the New England Cottontail suffers from an identity crisis. It looks so much like an Eastern Cottontail that DNA samples are often needed to confirm that it’s native, not alien. So even if you see one close-up, it’s tough to tell the rabbit is rare.